There is something so special about the bond between Daddy and Daughter. They can make us feel safe and secure, showing strength and protection and total acceptance. I still remember when I was a small girl, my Daddy washing my hands in the sink with his, how huge his hands looked holding mine, and something special about that feeling. Sometimes I have struggled to find a Father’s Day gift that expresses my love and appreciation of my Father, something that is well thought out and different, personal and special like our relationship, and I imagine that others do too – so I thought I would pull together a little guide of gifts for Dad from Daughter with my favourite gift ideas from other small businesses in the UK as well as my own. What better way for a father to keep his daughter near him always? Cufflinks are in solid silver featuring your loved ones prints. This can be a handprint, footprint, fingerprint or even a special signature or short message in someones own handwriting, or a doodle of Daddy by Daughter. Each piece is handmade and completely bespoke to your wishes. The perfect gift from any daughter to her dad this Father’s Day, choose his favourite colour and have a personal message engraved to let your dad know how much he means to you. This adjustable woven paracord bracelet. The strap can be made with two complimentary colours of paracord. A gift that can be cherished for years, your loved ones actual fingerprint in solid fine silver – this is one that will always mean so much.. 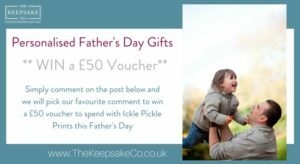 If you are looking for a unique gift and have left it a little late, how about a voucher for a portrait of Daddy’s little girl, or alternatively a special pet or even place, all painted from Dad’s favourite photo. Prices start at £60 plus p & p. For more info go to . memorable places and even some blank pages for them to work on together. Each album is created from scratch to make a truly bespoke and stunning keepsake that will stand as a reminder of just how loved and appreciated he is for years to come. These family portraits incorporate a real print from each family member! A great way to create memories whilst taking the prints for the keepsake as well as the finished print to remind you of the fun for years to come. The text and colours can be personalised to your requirements. Prices start from £26 for an A4 print. Gorgeous pieces. I think the dog tag is my favourite but I’m bias because I made a similar one for my husband a few years ago. I really love all the gift ideas, such talent out there from small businesses making fabulous handmade items! Thank so much for including my portrait service in the blog. What a fantastic selection of unusual gifts. I particularly love the hand casts. A gorgeous selection of unique gifts from Daughter to Daddy. Another great list of ideas for Father’s Day gifts. Loving the fingerprint jewellery from the wishing jar and the personalised album to put all those loose drawings & photos in. Aw some really lovely ideas! Well done for putting these together! I’ll be sure to share this ?